Jerry Matthias, 52, an Indianapolis iron worker, carries a sign as he watches speakers at a rally held by the Indiana Building Contractors Alliance and their employees against the repealing of the state law on public construction project wages at the Statehouse in Indianapolis, Monday, April 13, 2015. The repeal has been pushed by Gov. Mike Pence and Republican legislative leaders, who say the law keeps wages artificially high and costs taxpayers money. 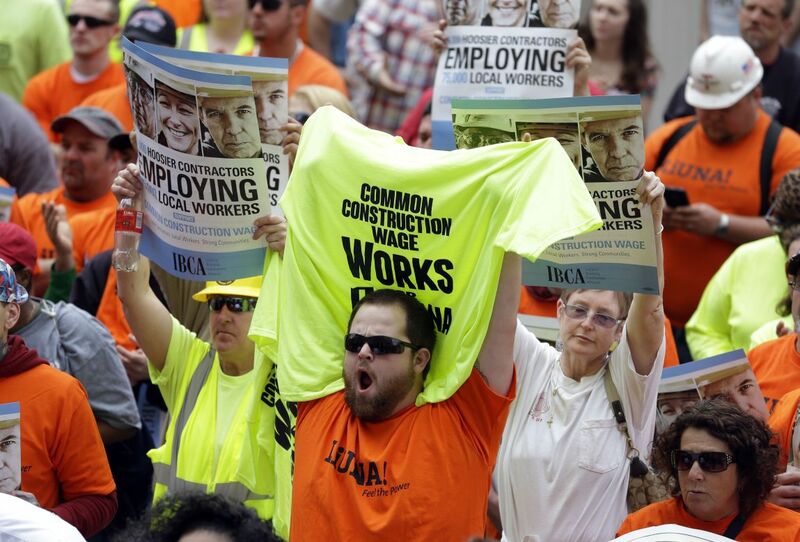 Todd Whitsit, of Terre Haute, Indiana, cheers at a rally held by the Indiana Building Contractors Alliance and their employees against the repealing of the state law on public construction project wages at the Statehouse in Indianapolis, Monday, April 13, 2015. The repeal has been pushed by Gov. Mike Pence and Republican legislative leaders, who say the law keeps wages artificially high and costs taxpayers money. Jerry Matthias, 52, an Indianapolis iron worker, watches speakers at a rally held by the Indiana Building Contractors Alliance and their employees against the repealing of the state law on public construction project wages at the Statehouse in Indianapolis, Monday, April 13, 2015. The repeal has been pushed by Gov. Mike Pence and Republican legislative leaders, who say the law keeps wages artificially high and costs taxpayers money. It’s one thing to support bad economic policy. It’s another thing to choose policies that disproportionately attack the livelihoods of Indiana veterans. Nearly one year ago today, with one stroke of a pen, Gov. Mike Pence and his allies in the Legislature managed to do both. In repealing Indiana’s prevailing wage law — known as the common construction wage — Pence disregarded the overwhelming consensus of economists who have concluded these policies do not increase construction costs but do promote stronger local economies and lower poverty. Earlier this month, first of its kind research from VoteVets.org exposed an arguably more troubling impact of Pence’s wage cut. It disproportionately impacts military veterans, who work in the skilled construction trades at substantially higher rates than non-veterans. The research also shows states with prevailing wage laws see even more veterans join in the construction workforce and a reduction in poverty among those veterans by as much as 31 percent. Those of us who have borne the cost of defending this country understand coming home from war can be just as trying as war itself. There are physical and psychological wounds to heal, strained family relationships to bridge and a difficult transition to civilian employment to undertake. These challenges have been well documented — in VA backlogs, suicide and divorce rates, an unemployment rate for post-9/11 veterans that consistently outpaces the national average and a poverty rate among veterans that has been climbing nationally and is approaching 8 percent in Indiana, according to the Department of Veterans Affairs. For generations of veterans like me, a job in skilled construction was the best way to avoid becoming one of these statistics. It was a way to put the leadership and problem-solving skills I learned in the military to work in my community in a way that could support a middle-class life for my family. But one year ago, Mike Pence and the Legislature decided we should be forced to take a pay cut. The effect of their decision is well documented by the research. More veterans will leave their jobs and lose their health care. More will join the ranks of the working poor and rely on government assistance. More veteran-owned construction businesses will close. More state construction contracts will go to out-of-state firms, using less-skilled workers. Construction material costs will go up, along with safety and workmanship problems. And while there’s no evidence that repeal will bring savings for taxpayers, there is plenty of evidence that it will boost the profits retained by well-connected contractors who fund the political campaigns of Pence and his legislative allies. The U.S. military now trains fully 20 percent of the skilled construction apprentices in the United States because it understands that the best way to address veteran underemployment is to help us prepare for middle-class career options in our nation’s fastest growing industries. It is sadly ironic that the wage-cut law that disproportionately impacts Indiana veterans was signed into law during the same month that honors those veterans who gave the ultimate sacrifice in defense of freedom. That’s not exactly “supporting the troops,” is it? The good news is it’s an election year, and soon we will all be able to weigh in on Pence’s attack on the middle-class construction wages of thousands of Indiana veterans. Laura Asher, of Valparaiso, served as a medic in the National Guard from 2002-2008, including combat deployment to Iraq in 2005-2006. She became a heavy equipment operator after participating in the Helmets to Hardhats program. The opinions are the writer's. When you attend a parade, enjoy a barbecue or salute a flag this Memorial Day, don't forget the day's real purpose. The locations the smell was the strongest are in red. Other locations are colored orange and yellow.